Imagine traveling from Southwest Florida to Key West in less than four hours. Impossible? Not if you board the Key West Express at either Fort Myers Beach or Marco Island. While the high-speed ferry skims the waters of the Gulf of Mexico, you relax and enjoy the sunshine and scenery. This gives new meaning to the old saying, "getting there is half the fun!" Getting to Key West used to be limited to either driving down the traffic-prone Oversea Highway or flying into Key West International Airport, which is not usually practical for those on a budget. Although the drive from Miami can usually be done in less than four hours, those traveling from Southwest Florida may find that the trip takes them all day. But taking the Key West Express is as easy as parking your car and boarding the large catamaran. You may choose from traveling in air-conditioned comfort inside or soak up the sunshine on the outside deck. A completely stocked galley and bar are available as are large flat-screened TVs with satellite television. The Key West Express isn't just a day trip. When making your reservations, you can plan to stay over in Key West and come back a different day—simply reserve your return date. When boarding, each passenger is allowed two small carry-on bags or pay an additional fee per piece for larger luggage. Coolers, alcohol, and glass items are not allowed on board the boat. Key West Express recommends booking your trip at least eight days in advance. This is not only to ensure you actually get a ticket, but also to make sure there is a boat from your desired location on the date you want. The Key West Express departs from Fort Myers Beach all year round and Marco Island, seasonally. Be sure to bring your confirmation code and photo ID to the ticket window on the day of your departure. The Key West Express departs daily from Fort Myers Beach (except when the calendar indicates no sailing) at 8:30 a.m. with ticketing and boarding beginning at 7 a.m. The terminal is located at 1200 Main St, Fort Myers Beach, FL 33931. The return trip from Key West to Fort Myers Beach departs daily at 6 p.m. with boarding beginning at 5 p.m. Uncovered, paid parking is available at the Fort Myers Beach location. Travel time to Key West is about 3.5 hours. The Key West Express departs from Marco Island seasonally from December through April (except as noted on calendar) at 8:30 a.m. with ticketing and boarding beginning at 7 a.m. During the summer the Ferry leaves from Marco Island on Tuesdays and Wednesdays at the same times. The terminal is located at 951 Bald Eagle Drive, Marco Island, FL 34145. The return trip from Key West to Marco Island departs daily at 5 p.m. with boarding beginning at 4 p.m. Uncovered parking is available at the Marco Island location free of charge. Travel time to Key West is about 3 hours. The Key West terminal is located at 100 Grinnell Street, Key West, FL 33040. The company reserves the right to deny boarding to passengers who aren't aboard at least 30 minutes before departure, so be on time! 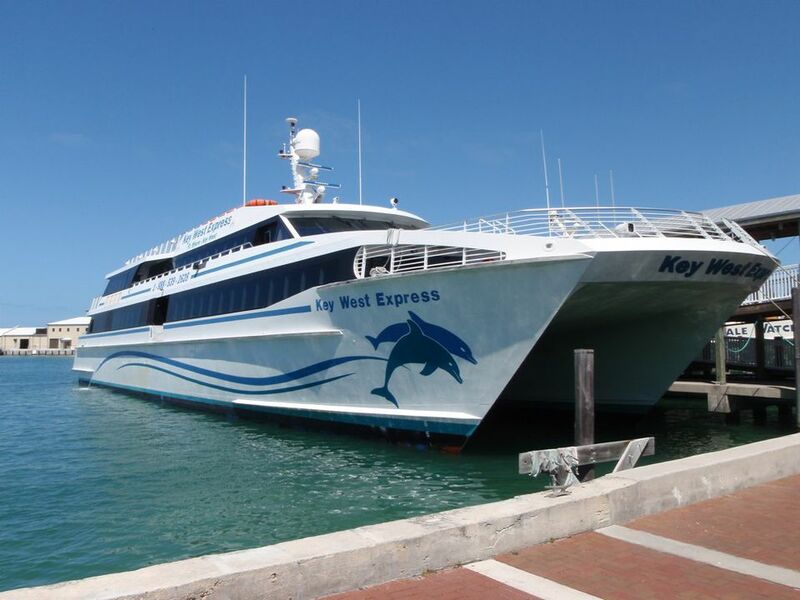 The Key West Express strives to create a comfortable environment for all its passengers and offers air-conditioned interiors, sun deck loungers, flat screen TVs, and a full-service bar with burgers and sandwiches, and alcoholic and non-alcoholic drinks. The company prides themselves on their airline-style reclining seats as well, so expect comfort. Arrangements can be made to take along your bicycle as well, but space is limited so notify the boat ahead of time. Additionally, the crew can accommodate disabled passengers and their wheelchairs or ECVs. The Key West Express even has space for household pets as well. But reservations must be made ahead of time. Pets also must be kept in carriers or crates for the duration of the trip. The Key West Express docks at the Flagler Terminal, which is only about a 10-minute walk from Duval Street. Transportation is also available should you need to catch a taxi to get to your hotel.